A welcomed new occurrence to the Nintendo eShops are budget titles, whether it be Blok Drop U or Bird Mania Christmas 3D. Joining these ranks is SKYPEACE, a brief, enjoyable stage based runner that finds players surfing the skys, and battling aliens, attempting to stop an invasion. Or at least thats what we could gather from the story, it isn't mentioned once in the game, or the instruction manual. The instruction manual raised more questions than answers, such as "You say there are power ups, but what are they?" Another annoyance is the general lack of description for treasures you collect, since there is a handful of special treasures to collect and unlock achievements for, but you aren't told the name of the treasure and don't know how to distinguish them. It is a confusing mess. Thankfully, the gameplay itself is quick to learn, as well as enjoyable to play. 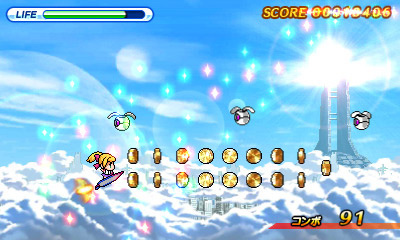 You move your character, either Surf, a boy, or Pure a girl around on a three by three grid and attempt to dodge all of the aliens while collecting coins/treasures and racking up combos. Combos are earned by collecting coins and dodging enemies, the longer you can mantain your combo and take damage, the multiplier is lost. A single hit shield can be picked up to prevent this from happening, but most of the time, you are on the defensive, just trying to survive. The few occasions you can actually attack are when you hit a whirlwind that looks like it will inflict damage, instead will briefly speed you up fast enough to destroy enemies. The only other time you can attack is when you reach a multiplier anywhere from 2.0-4.0, we couldn't determine an exact number, either Surf or Pure will cruise on by and drop off an invinciblity power up that acts like a magnet to coins and destroys enemies on contact. While this is great, it can only be used once per stage, and is generally activated early on in the stage, not towards the later somewhat difficult second halves to the stages. 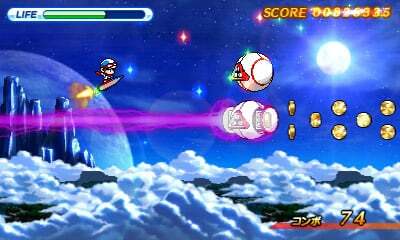 SKYPEACE is rather brief, with only 10 stages and a tutorial stage, most gamers will have beaten the game within one to two hours. Replayability is somewhat high if you are a completionist, but besides aiming for a higher score on a previous level, there isn't much else to see here. An endless mode would have been a welcome option, definitely raising replayabilty. Another small annoyance is the sound you make when collecting a coin, it is fine on its own, but when you are collecting massive amounts at a time, it can get rather loud and irritating. Other than the coin sound, the soundtrack is fun and upbeat, and the pixel graphics look very sharp on a regular 3DS screen. We do wish that the developers chose to make certain enemy attacks other colors. 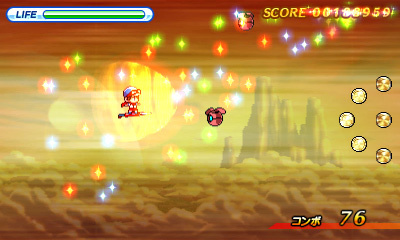 On a few stages, certain attacks blend into the backround and look somewhat like a treasure. While this does sting, it is completely manageable once you get used to it, but one shouldn't have had to get used to it in the first place. The 3D effect isn't half bad either, making it really seem like you are flying in the clouds. SKYPEACE is a fine budget title, offering a quick game if needed, but not much else. If you are in the mood for a cheap stage runner then give this a shot, it is certainly worth its dollar price tag, but not much more. Dollar price tag? Is it $1 or $2? If its only one, I'll get it at some point. I tend to have a little over a dollar left on my account occasionally. I am 99% sure that the price is 99 cents. Then it has earned a purchase from me!